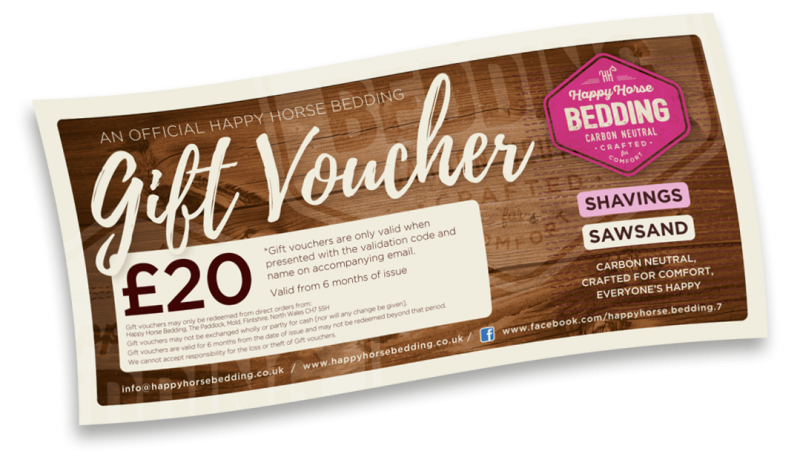 Give someone an OFFICIAL HHB E-GIFT VOUCHER for SHAVINGS or SAWSAND and bring a little comfort to their lives… or rather their horse’s life. £10, £20 or £30. Just fill out the form below. We’ll drop you a line to take payment and send a pdf voucher and unique code that you can print and present, or simply email on to the lucky recipient! *Gift vouchers are only valid when presented with the unique validation code and name on its accompanying email. Valid from 6months from issue. Gift vouchers may not be exchanged wholly or partly for cash [nor will any change be given]. Gift vouchers are valid for 6 months from the date of issue and may not be redeemed beyond that period. We cannot accept responsibility for the loss or theft of Gift vouchers.